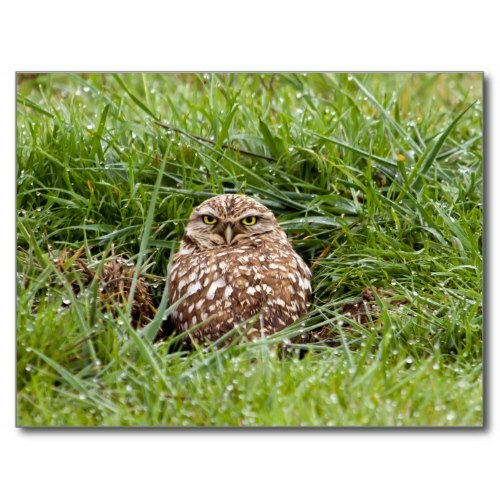 A wonderful, cute, green, rain-soaked photograph of a burrowing owl, looking straight at you, amidst grass still laden with rain drops after a brief spell of rain. Burrowing owls are small, sandy colored, long-legged owls, found throughout North and South America, in grasslands, rangelands, agricultural areas, deserts, or any other open dry area with low vegetation. They nest and roost underground in burrows they’ve dug themselves or taken over from prairie dogs, ground squirrels, or tortoises. A wonderful wildlife photo, taken by Thomas Muehleisen, after he had watched and photographed this burrowing owl for two weeks. Featured here on a custom photo postcard. Makes a great mail to owl lovers, bird watchers, budding wildlife photographers, children, grandkids, wildlife lovers, animal lovers, and more.